A new system developed by scientists at the Morgridge Institute for Research and the University of Wisconsin-Madison may provide a faster, cheaper and more biologically relevant way to screen drugs and chemicals that could harm the developing brain. 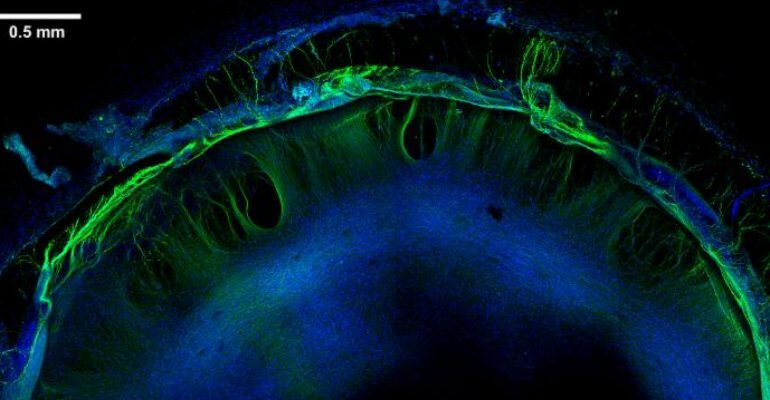 Reporting in the Sept. 21, 2015 issue of the Proceedings of the National Academy of Sciences (PNAS), the team describes a new approach for predicting developmental neurotoxicity that uses stem cells to model features of the developing human brain that could be targeted by toxic chemicals or drugs. The research also is important to addressing growing concerns about the rising incidence worldwide of neurodevelopmental disorders such as autism and the potential role of environmental chemicals. RNA-sequencing data was collected from neural tissue constructs that were individually exposed to 60 different “training” chemicals — both safe compounds and known toxins — and machine learning was used to build a predictive model from these results. The algorithm proved remarkably accurate: After training with known chemicals using duplicate samples and two time points (240 neural constructs in total), the model correctly classified nine out of 10 additional chemicals in a blinded trial. This project reflects a diverse collaboration between the Morgridge Institute’s regenerative biology team, led by stem cell pioneer James Thomson, and leading UW-Madison experts in tissue engineering and machine learning. Biomedical Engineering Professor William Murphy led the development of synthetic “hydrogels,” or matrices that enable stem cells to grow naturally and self-assemble into a complex network of tissues. And Biostatistics and Medical Informatics Professor David Page developed the predictive model using two types of holdout-testing methods. Thomson says the Wisconsin project has potential to improve drug testing, but with more than 100,000 mostly untested chemical compounds used in commerce, the impact could be even greater for screening chemicals. Schwartz says the RNA sequencing data generated by this study will be beneficial to future studies by helping to identify potential toxic profiles or fingerprints. “These datasets provide valuable information about changes in gene expression that researchers can mine to better understand mechanisms that might be disrupted during human brain development,” he says. 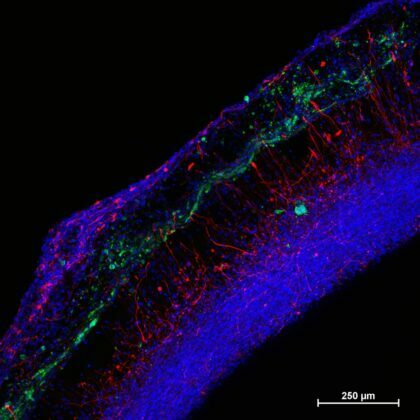 3D organization within the neural constructs: This confocal microscopy image illustrates endothelial cells (green), glial cells (red), and nuclei (blue) growing together in an integrated way. The neural tissues were removed from the inserts and placed on a glass bottom petri dish for imaging. One unique element of the project is the level of consistency achieved across hundreds of samples — especially given the cellular diversity of the neural tissue model, which included neurons, glial cells, interconnected vascular networks, and microglia, which is the immune cell of central nervous system. 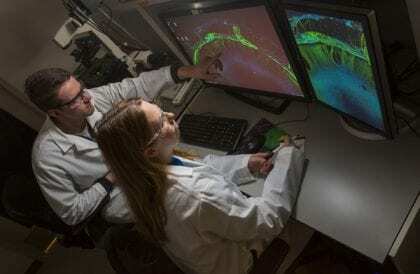 The neural tissue constructs developed in this project are the first to incorporate vascular and microglial components into a 3D model of brain development derived from human pluripotent stem cells. The synthetic material used to help the tissues grow was a key part of the early success of this work. “These hydrogels are minimally complex in that they only present peptides that allow the cells to attach and degrade the matrix. The cells will do the rest of the work on their own — biology does a better job forming tissues than we do,” Schwartz says. In the original proposal, Thomson notes that “if appropriately specified, precursor cells are brought together in the right environment, a degree of self-assembly, differentiation, and maturation will occur.” The synthetic materials used to culture the cells were key to achieving the consistency needed to successfully screen so many samples. The National Institutes of Health (NIH) funded this project along with 10 other universities in the Tissue Chip for Drug Screening program. The Environmental Protection Agency provided the list of well-characterized toxic and non-toxic chemicals used in the study. Other co-authors of the study include: Nicholas Propson, Jue Zhang Peng Jiang, Bao Kim Nguyen, Ron Stewart and Yu Wang, Morgridge Institute; Collin Engstrom, Biostatistics and Medical Informatics and Computer Science; Victor Santos Costa, University of Porto, Portugal; and William Daly, Biomedical Engineering.